Michale S. Fee, Ph.D.,of the Massachusetts Institute of Technology, for work on a specially miniaturized microscope to observe neural activity in songbirds, plus new data processing technology to support it, offering unprecedented views of a brain as it learns. 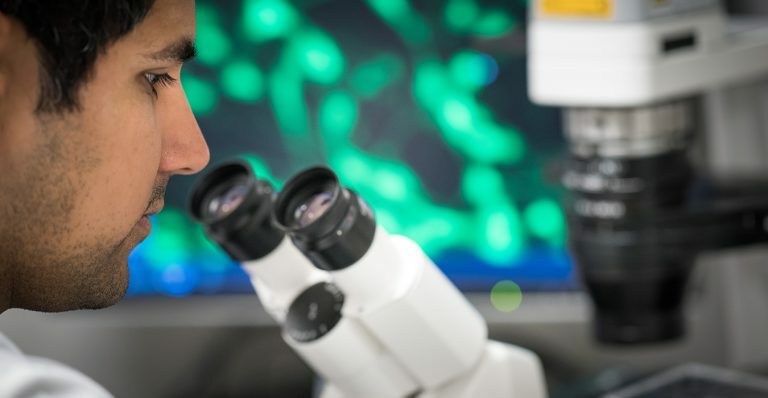 Marco Gallio, Ph.D., of Northwestern University, whose project involves creating new methods for re-wiring synaptic connections in the living brains of fruit flies, and validating them by exploring links between learned and innate behavior. Sam Sober, Ph.D., of Emory University, and Muhannad Bakir, Ph.D., of the Georgia Institute of Technology, are developing a new class of flexible electrode arrays with on-board data processing that can record large numbers of spikes in the muscle fibers of freely-behaving birds and mammals, to gain new insights in how brain signals control behavior. Since the Technology Award’s founding in 1999, the McKnight Endowment Fund for Neuroscience has contributed more than $13 million to innovative technologies for neuroscience. The Endowment Fund is especially interested in work that takes new and novel approaches to advancing the ability to manipulate and analyze brain function. Technologies developed with McKnight support must ultimately be made available to other scientists. This year’s selection committee also included Adrienne Fairhall, Timothy Holy, Loren Looger, Liqun Luo, Mala Murthy, and Alice Ting, who chose the 2018 McKnight Technological Innovations in Neuroscience Awards from a highly competitive pool of 97 applicants. Studying neural activity in the brains of animals is a long-standing challenge for researchers. Current approaches are imperfect: the current size of microscopes require animals to be restricted in their activity, and these microscopes offer a limited field of view of neurons. 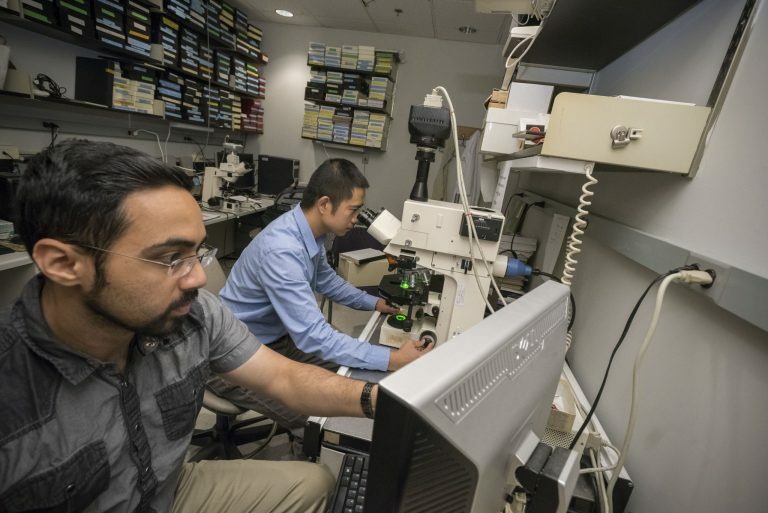 By making breakthroughs in microscope miniaturization, Dr. Fee and his lab are developing the tools needed to see what’s going on in an animal’s brain while the animal is free to perform natural behaviors. The head-mounted microscope allows Dr. Fee to observe changes in the brains of juvenile birds as they learn to sing their songs. As they listen, repeat, and learn, Dr. Fee documents the neural circuits that develop as part of this complex learning process. These circuits are related to human circuits that form during complex learning of motor sequences, such as learning to ride a bike, and are disrupted in certain conditions including Parkinson’s disease. Given his aim to document a natural learning process, it’s of vital importance to be able to record neural activity during natural behaviors. In addition to miniaturization, the new microscope will have the ability to record an order of magnitude more neurons than other techniques used on freely-behaving animals and will be paired with new data analysis that will allow researchers to make observations in real time and adjust their experiments, speeding the research process. It will have immediate and broad applications for researchers exploring all kinds of brain behaviors in small animals. 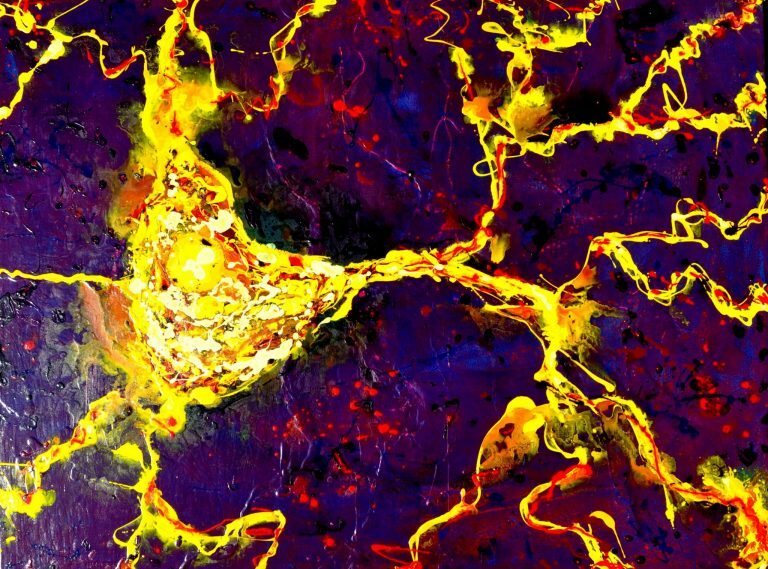 This research aims to expand our understanding of how brains work by allowing scientists to selectively prune synaptic connections and to encourage new connections between neurons. This re-wiring of the brain will allow researchers to understand more precisely which connections play a role in specific subsets of neurological effects. Each neuron within a brain circuit connects to multiple targets. Each target may have a unique function, and therefore process the same incoming information in a completely different way. For example, some specific neurons in the fruit fly brain carry information about the external environment which is used to quickly get away from imminent threats (an innate behavior), but also to produce long-lasting associations through learning. The proposed technology will allow researchers to pinpoint the connections that are critical to each process by selectively removing synapses to the learning centers while leaving all other connections intact. The project aims to use genetic engineering to produce designer proteins that will mediate either repulsion or attraction/adhesion between genetically defined synaptic partners in the intact brain of living animals. In addition to proving that this kind of rewiring of brains is possible, the research will result in new fruit fly strains with unique genetics that can immediately be shared with other researchers. By design, these tools can be easily modified for use in any animal model or applied to different parts of the brain, enabling a whole new class of neurological studies with profound implications for our understanding of how human brains work. Our understanding of how the brain coordinates muscle activity during skilled behavior has been limited by the technology used to record such activity – typically, wires inserted into muscles that can only detect the summed activity of many individual signals that the nervous system uses to control muscles. Drs. Sober and Bakir are developing what is in essence a “high definition” sensor array (a collection of many small sensors) that resolves many of these issues by allowing researchers to detect and record very precise electrical signals from individual muscle fibers. The proposed sensor has many detectors that record from a muscle without damaging it. (Prior approaches relied on wires that could damage muscles when inserted, especially small muscles used in fine motor skills.) The arrays are fabricated from flexible materials that fit the shape of a muscle and change shape as the animal moves. Furthermore, because the arrays collect exponentially more data than prior devices, they have built-in circuits to collect and package data before transmitting the signals to the researcher’s computer. A prototype version of the array has already revealed new insights: previously, it was believed that the nervous system controls muscle activity by regulating only the total number of electrical spikes sent to a muscle. But precise detection revealed that millisecond-level variations in multi-spike timing patterns change how muscles control behavior. The new arrays will be designed for use in mice and songbirds and will help us understand the neural control of many different skilled behaviors and potentially provide new insights into neurological disorders that affect motor control.